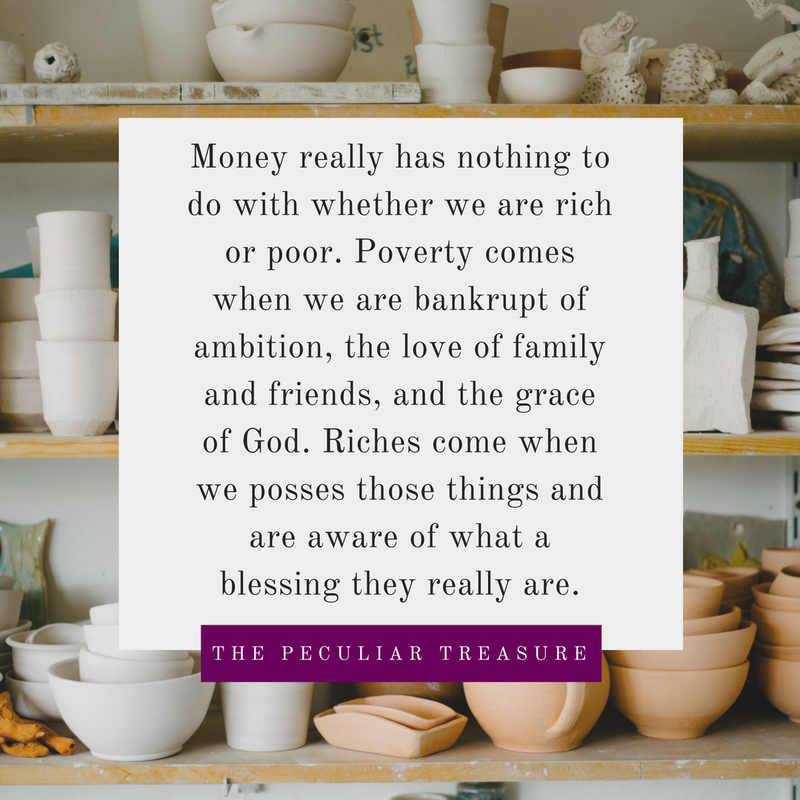 The Peculiar Treasure: Why I Will Never Say "I'm Poor"
Why I Will Never Say "I'm Poor"
There's just no way around it, you guys- adulting is hard. There's always something left on the to-do list, always a goal or two that has remained unreached, and always a bill to pay. Ask any marriage counselor and I bet they'll tell you that finances are really tough on a marriage, and being financially secure is important for that reason (along with others of course). And financial responsibility is, of course, important. We need to be good stewards of our money. I struggle in that area and want to improve. But sometimes, financial hardship can become an obsession, which causes a completely different problem. I hear people talking about their money woes all the time, and my name can definitely be thrown into that hat. But one thing you will never hear me say is that I am poor. If you ever hear those words come out of my mouth, it's absolutely a slip up, because despite some financial hardships, Taylor and I are anything but poor. The term poor is often used to mean "lacking", "needy", or "not having enough" (source). And yes, it means having less money than the societal average. Technically, by that last definition, Taylor and I would be considered poor. But I believe that if you have a roof over your head, food on the table, and a bed to sleep in, you are not poor. When I drive down the streets of Charlotte, I see plenty of extremes: large, beautiful houses with manicured yards and fancy cars parked in the driveway- those types of homes cover a large portion of the city. But then, if you adventure just a few blocks over, you can find houses that are crumbling at the seams, people with tattered clothes, and beaten up cars with taillights that don't work. I bet if you did a survey about what the difference between those two people groups is, you'd hear a lot of "one group is rich and one group is poor". But in my humble opinion, neither of those groups are poor. Even though one group has less than the other, each individual still has a home, a place to sleep, and a full belly. That's more than a lot of people can say. And so even when discussing money, you will probably never hear me say that I am "poor". Am I financially challenged? Absolutely! We have bills that end up accruing late-fees, we have a student loan we have to make payments on, and life doesn't slow down so that we can catch up. In all reality, poverty doesn't always refer to money. Poverty can occur in the home, in the work-place, and in our hearts. A person can be monetarily rich and still be bankrupt in other areas of their life. For me, there are several ways that I know I am rich in my circumstances. First of all, Jesus died to save me from my sins. He won and nothing/no one can thwart him. Secondly, I have family and friends who love me deeply and are here for the long-haul. I have hobbies that I enjoy, and goals that spark a fire in me. I am rich, not in possessions or money, but in the things that matter most to me anyway. 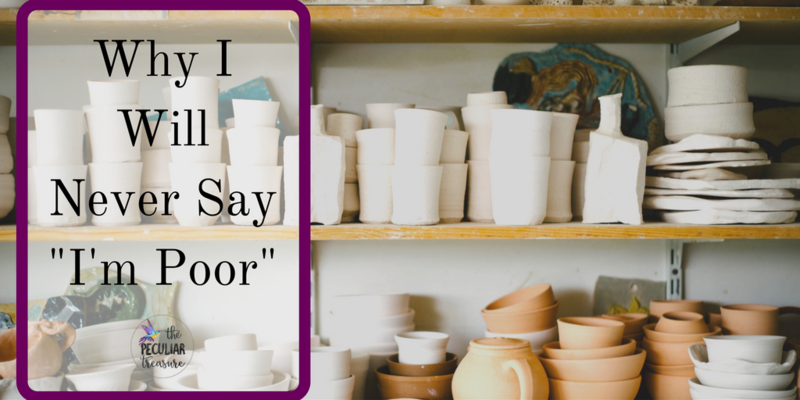 Do you find yourself talking about how poor you are? And is it true? Are you really poor, or are you simply financially challenged? I always try to stay away from saying I am poor because I know deep down that I am far from it. In the things that matter most, I am abundantly rich. And I would challenge you to view your life through that lens as well. If you have blessings that you can't deny, and if you have food to eat and a place to sleep, you have so much more than a lot of people around the world. Realize first of all, that you actually are fairly blessed monetarily, even if you are just barely getting by. And secondly? Remember that true riches don't have anything to do with money anyway. True riches are found firstly in the Salvation of Jesus, and secondly in those who surround us with love, friendship, and encouragement. No matter how financially challenged we are, I bet there are quite a few riches in our lives if we would just open our eyes. Amen, sister!! When I was in college, I found myself saying "I'm poor" a LOT when a friend called me out on it and convicted me of what you're talking about! I never thought of it that way before and would flippantly through the phrase around. Micah and I are very diligent about not referring ourselves as "poor" because we certainly aren't thanks to our salvation in Jesus! In my devotions this morning I was reading in Philippians and how Paul is in jail while he's writing to the church in Philippi. Talk about down and out from our standards, but the words "joy" and "rejoiced" are used at least 14 times! Very humbling and convicting :) Thanks for the reminder, sister! We're rich in Jesus! That is such a great point about how many times Paul uses the word "Joy". What a good reminder! When my mom was in high school, some kid was ragging on her about why she had work everyday after school or family finances and stuff and she looked him in the eye and said, "My father own the cattle on a thousand hills." (A reference from Psalms.) That kid was probably utterly confused but I'm so glad Mom raised us with that kind of attitude--no matter what the bank may say, we already have abundantly more than we need or deserve, and the entire universe belongs to our Father. This is so true. Really puts things into perspective. I have definitely fallen into the trap of saying I'm poor, while skyping with my friend via our ipads, cozy in my nice apartment with a full meal in my stomach while my boyfriend watches netflix on our flat screen. 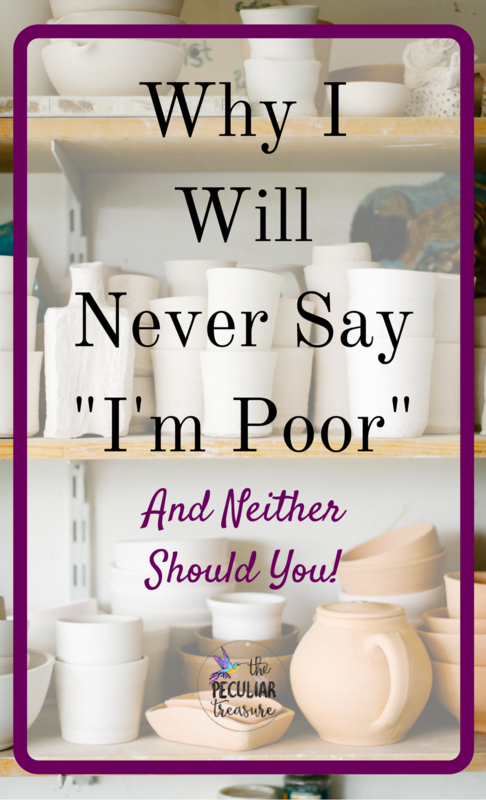 REALITY CHECK TIME: What is my definition of poor and why do I think I'm there? because I can only afford to take so many vacations and can't afford 800 dollar shoes whenever I want? ... I think it's so easy to think of ourselves as having less in today's world, rather than looking around at just how spoiled we really are. thank you for the amazing perspective. Being poor is definitely not just monetary - i love the emphasis on that point. We can not have a lot of money but still be rich in life. Great post! It's so true that riches aren't only monetary. If you have a healthy and happy family you truly have alot! Great read! I never say we're poor. Sometimes I'll say "we don't have the money right now", that's not to say we're broke or poor, it's just that we don't always have money to go out to dinner or buy that new material item we really don't need. One time a friend told me that she took her son to the store and he asked for a new toy. She told him not today then he asked "Why Mommy? Are we poor?" For some reason that broke my heart. I know he didn't know what he was asking but it really made me sad to think that he thought they were poor. That's just one of those stories that has stuck with me and stayed on my heart, making me aware of the words I say because my child will mimick them. My first time visiting your blog, so first off let me say I love the name and the header! There have certainly been times when we've been financially challenged. While I hate the feeling of insecurity that comes with that, I also know if deepens appreciation of blessings. Nicely said. Great read. I never say I'm poor and I feel like it's all about perspective. I have so many things that I'm thankful for that have no price. No money can ever buy happiness, peace and joy. Where I live, there's a saying that could be translated as: "Health above all things". After going through so many medical issues I can say that this is so true - I could afford every treatment and pill I had to take but I couldn't buy a good health. The list goes on about relationships and things in life that just can't be bought. So, it's definitely something to think about when you're lacking money.